I am so hungry right now typing this post. This meal is right up my alley. 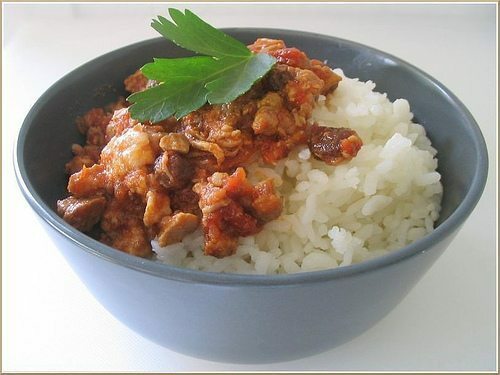 I love picadillo and this sweet and spicy version in the crockpot is just fabulous! I have even made a double batch and used it as burrito filling later in the week or have frozen it for another meal. I love cooking double batches for meals later! Heat oil in skilled over medium low heat until hot. Cook and Stir onion and garlic until translucent about 4 minutes. Combine Tomatoes with juice, vinegar, chipotles, raisins, cumin & cinnamon in medium bowl. Pour over pork. Cover and cook on low 5 hours or high 3 hours. or until pork is fork tender. Shred pork using 2 forks. Cook 30 minutes longer. Adjust seasonings before serving with rice.